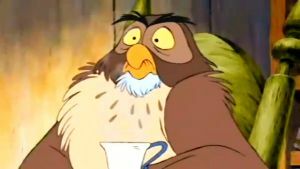 OWL: Oh, it does bring to mind a distant nephew of mine. An odd sort of fellow. He became a sailor and fell in with a member of the feline persuasion. My... TIGGER: ... family tree? My family tree! Why didn't I think of thinkin' of that? So long, beak lips! Thanks for the tip! Ooh, hoo, hoo, hoo, hoo! Hoo, hoo, hoo! OWL: I say. Was it something I said? NARRATOR: And so began Tigger's grand search for his family tree. He searched high. He searched low. He searched near, and he searched far. 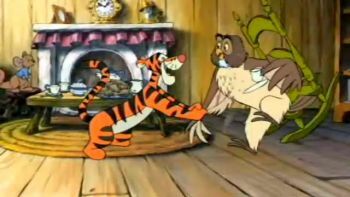 TIGGER: Yoo-hoo! Family! Hello! 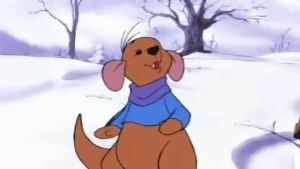 ROO: Tigger. How are you gonna know which tree is your family tree? 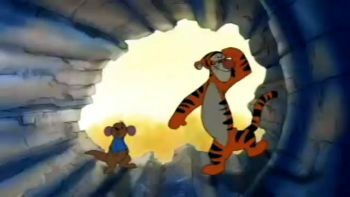 TIGGER: Why, that's obvious, Roo boy. 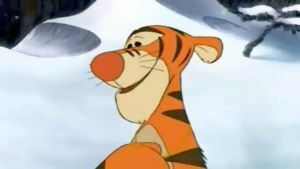 My Tigger family tree has got to be the biggest, hugest and most gigantical tree in the entire Hundred Acre Woodses on account of all the enormous numerical numerous numbers of Tigger family members that'll be on it. And besides and furthermore, it'll be all stripedy, just like yours truly. Hoo, hoo, hoo, hoo! The only question is, where could my family tree be?